Sometime in the 15th century, a ship caught fire off the coast of Koh Kong province and sank about 20 meters to the ocean floor. Over 500 years later, a group of Vietnamese fishermen cast their nets about 20 km off the coast of Koh Sdech island and hauled in an unlikely catch. They might have snagged one of thousands of pieces of Thai ceramics that sat alongside Chinese por­celain, ivory and untold other ar­tifacts, evidence of a bustling maritime trade that stretched across Southeast Asia and beyond. Surfacing and cataloging the artifacts began in 2006 and involved money from a casino magnate, underwater dives by an alleged Russian fraudster, and expertise from Cambodian and American archaeologists. A recently completed inventory of the objects hints at surprising connections between the sea trade and centuries-old jars laden with human bones hidden high on the rid­ges of the Cardamom Mountains. By the time the Koh Sdech ship sank, Cambodia already had centuries of experience trading along its coast. Chinese records document a loosely-affiliated string of states along the Cambodian coast known as Funan that traded along a route connecting China to Southeast Asia and India, according to a paper by Geoff Wade, a researcher on historical Asian relations and a visiting fellow at Australian National University. Trade appears to have waned somewhat as routes changed. But carvings on the Bayon temple dating to the late 12th century depict a two-masted Chinese junk, and Chinese diplomat Zhou Daguan wrote of Chinese merchants living in Angkor Thom, “some of whom had been there for many de­cades,” according to Mr. Wade. The abandonment of Angkor Thom in the 15th century did not spell the end of this trade, said Nancy Beavan, an American ar­chaeologist who has studied the Koh Sdech shipwreck and Cardamom mountain ceramics extensively under a grants from the Friends of Khmer Culture and Royal Society of New Zealand. 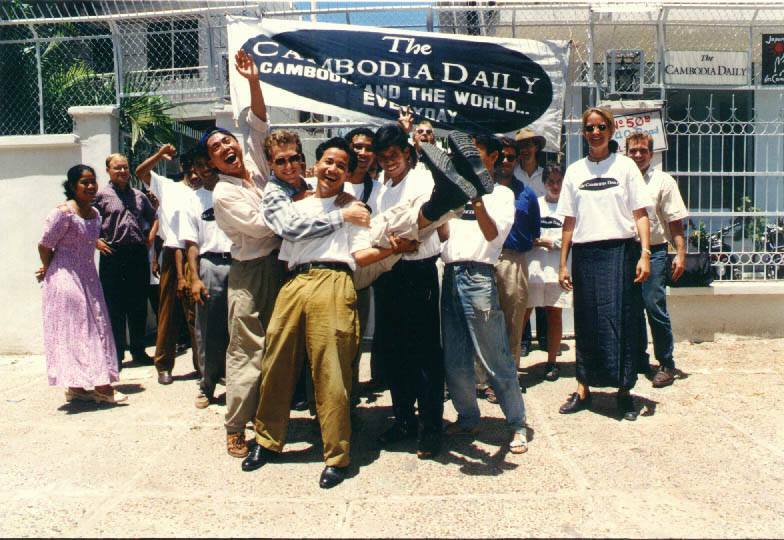 “The decline of Angkor and the establishment of Mekong and tributary port cities such as Phnom Penh and Longvek from the late 1400’s onward is an example of how this period is not at all the ‘Dark Ages,’ but rather a blossom­ing of the potential for international trade,” Ms. Beavan wrote in an email on Thursday. The ship found off the coast of Koh Sdech shows the bounty of those exchanges. The vessel’s origins and destinations remain murky, according to Tep Sokha, an archaeologist at the Ministry of Culture who has spent the past three years catalog­ing the ship’s remains. “Maybe it got caught in a storm and caught fire,” Mr. Sokha said on Thursday, adding that pirates were also not unknown to ply the waters. 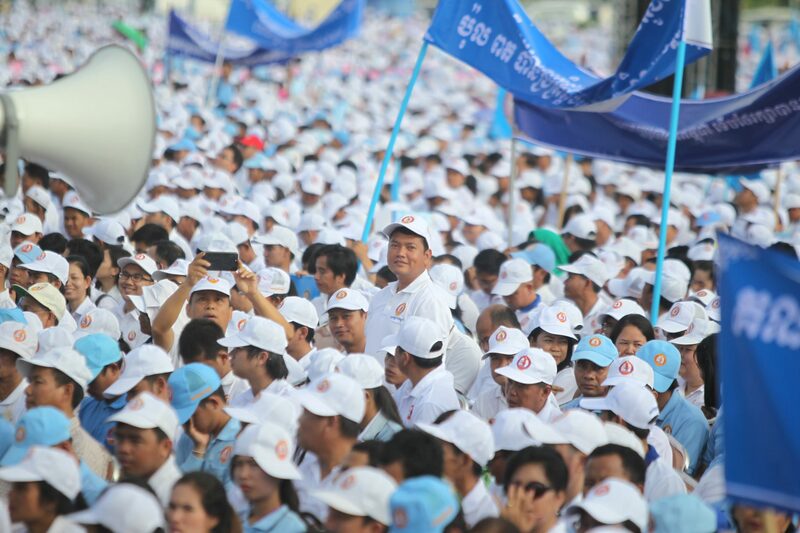 Provincial authorities got wind of the wreck in 2005 after word trickled up from the Vietnamese fishermen who first pulled up the artifacts, Mr. Sokha said. 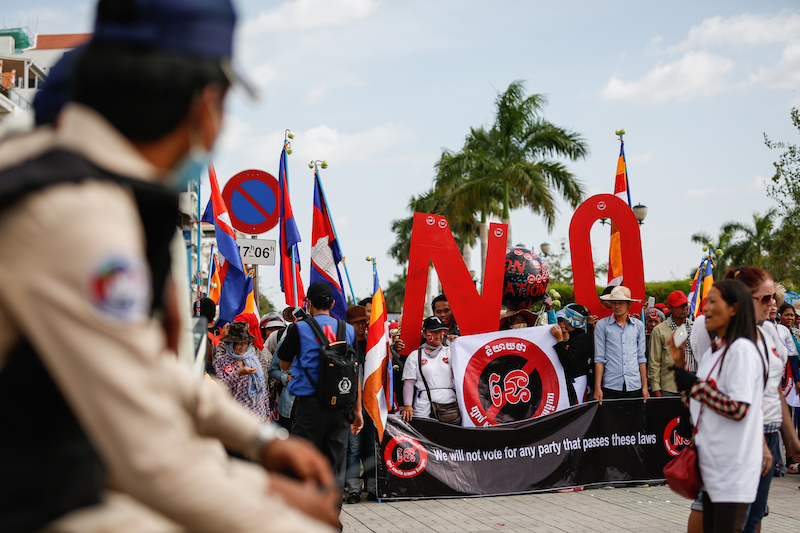 Although looters had begun to steal some of the ship’s valuable cargo, this stopped after Koh Kong casino magnate Ly Yong Phat paid for divers to properly excavate the site and haul out the ship’s extensive cargo, according to Mr. Sokha. Russian businessman Nikolai Doroshenko was involved in several early dives of the site, according to Mr. Sokha. Mr. Doro­shen­ko was released from prison last year due to poor health after serving two months for allegedly defrauding his onetime Russian business partner out of millions of dollars. “I sent him emails many times but never get a reply,” Mr. Sokha said. As the divers recovered artifacts, authorities attempted to prevent further looting. 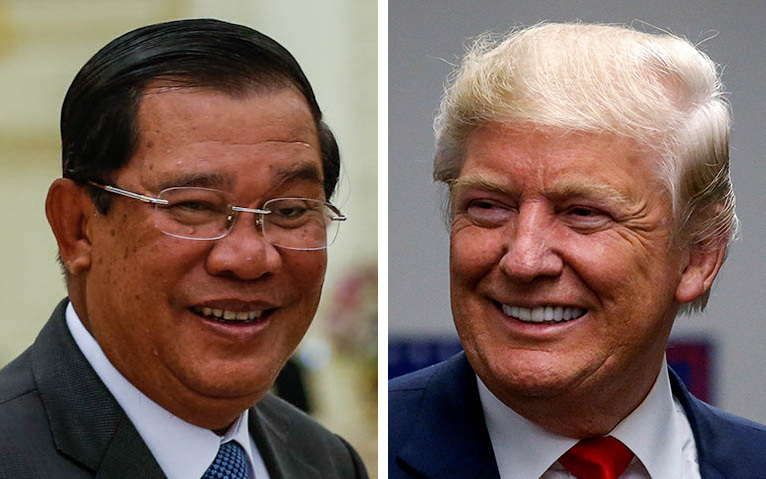 “A Cambodian navy ship supposedly was sent to deter looters, I believe during the recovery funded by [His Excellency] Phat,” Ms. Beavan wrote. “There were literally tons of ceramics brought up from the wreck, both whole jars and plates as well as smashed pieces, and planks from the shipwreck,” she added. Ra­diocarbon dating later found that the ship’s remains were from the 15th century. The vast majority of the haul consisted of jars that Ms. Beavan and Mr. Sokha traced to trade with the Siamese capital of Ayutthaya. 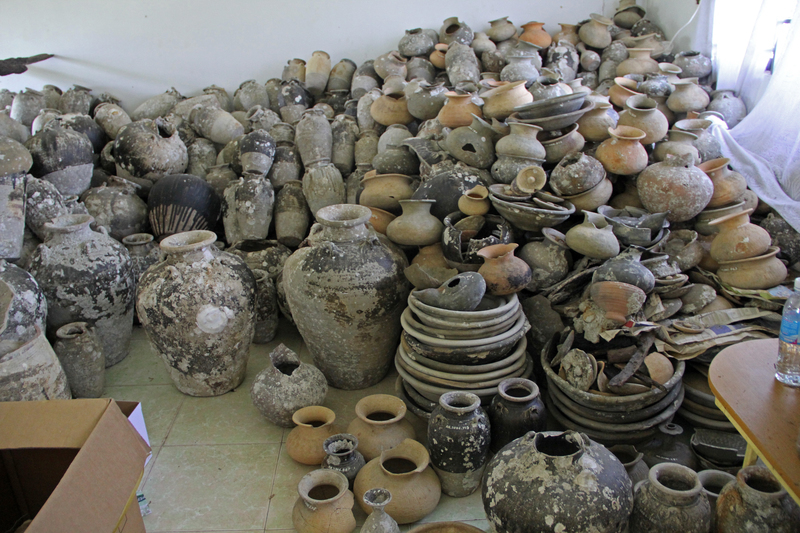 “Most of the products are from Mae Nam Noi kiln,” Mr. Sokha said, referring to a site known for its four-lug jars found in shipwrecks from Japan to the Cape of Good Hope. Divers also found porcelain from China, two ivory tubes, a “hand­held cannon,” an ingot balance, cooking pots, water jars, and metal trays, according to Mr. Sokha. For almost a decade, the artifacts languished in a small room behind the provincial courthouse in Koh Kong. “The ceramics had been dredged up, put in the provincial courthouse storeroom, and remained there untouched until our assessment trips in 2013; after that I wrote the funding proposals for Sokha to start cataloguing and conserving the ceramics,” Ms. Beavan explained. Ms. Beavan was interested in the ceramics because many of the jars bore a remarkable resemblance to those she had seen in her other research project deep in the Cardamom Mountains. “Many of the storage jars found in the wreck are exactly the same as those we found, in great numbers, in every one of the ten jar and coffin burial sites that my project located in the Southern Cardamom mountains,” Ms. Beavan wrote. “Imagine, coming upon a remote, natural rock ledge in the deepest reaches of the Carda­moms, and finding a trove of from 5 to 50 large (height 56cm, width at shoulder, 50cm) stoneware jars filled with the skeletons of a people who practiced a unique burial ritual for that 15th to 17th century period,” she continued. Archaeologists remained stumped on the identity of these highlanders. Why did they place their dead in jars instead of cremating them like other Buddhists? Were they related at all to the Khmer in the lowlands, and what ever happened to them? It is clear, however, that “they seemed to have rather an obsession with obtaining these jars, and then taking them to crazily remote places high in the mountains”—jars that derive from Ayutthaya and that Ms. Beavan believes may have come from maritime trade with merchants eager for the forest’s bounty of cardamom, precious woods and resins. Now that Mr. Sokha has finished cleaning and reconstructing the artifacts, he said the Ministry of Culture was planning a new museum in Koh Kong that it hoped would lure tourists to the area. “They can show all of the artifacts from the ship,” Mr. Sokha said. The ministry is also considering adding a team dedicated to underwater archaeology.